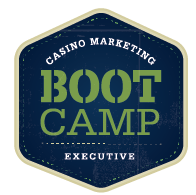 Casino Marketing Boot Camp is different. That’s what they all say. Right? Founders Nicole Barker and Julia Carcamo believe in sharing their knowledge. Look at a casino marketing conference; chances are they have spoken and participated at some point. But what happens AFTER these great conferences and to all the ideas you gather while you’re there? THAT’S where Boot Camp is different. Boot Camp isn’t about the great presentations. Sure, there will be great speakers telling you great things and giving you more ideas. What makes this two-day event is the hands-on planning you will do to put all your great ideas into focus and into actionable plans…and along the way we’ll experience New Orleans and maybe do a few “mental pushups”. We thought so! Join us and feel free to include a mentee. This will be a memorable, valuable experience.